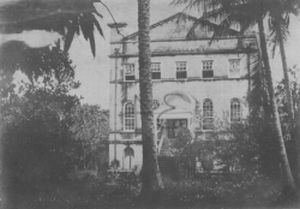 On February 16, 1827, The Church Missionary Society (CMS) founded Fourah Bay College, the first college in West Africa. The first principal of the college was Rev. Edward Jones, an African American minister. It was located atop Mount Aureol in Freetown, the capital of Sierra Leone. Originally intended as an Anglican missionary school to train teachers in the promotion of education and Christianity, it became a degree granting institution in 1876, when it became affiliated with Durham University in England. As a result of the affiliation, students at Fourah Bay studied the same curriculum and took examinations identical to those administered to Durham University students. The curriculum of both institutions reflected the popular subjects of liberal arts institutions of the era: Latin, Greek, Hebrew, Arabic, History, Natural Science, French, and German. Its most prominent 19th and early 20th Century graduates included Bishop Samuel Ajayi Crowther, the first African Bishop of the Anglican Church, J. E. Casely Hayford, an early advocate of education and self-rule for West Africans, and Henry Rawlingson Carr, a prominent Nigerian educator and administrator. As one of the few places in pre-Independence Africa to offer post-secondary education, Fourah Bay College attracted sons (and daughters) of elite Africans from across the continent. Its presence in Freetown allowed the city to tout itself as the Athens of West Africa. During World War II, the British — the colonial government in Sierra Leone — took over Fourah Bay College because of its strategic location in Freetown and used the buildings as part of the war effort. The faculty, staff and students of the institution relocated forty miles away in temporary facilities in Mabang, Sierra Leone. After the war, Fourah Bay College returned to its location on Mount Aureol in Freetown. Fourah Bay College continued its affiliation with Durham University until 1967, at which time the Sierra Leone government merged Fourah Bay College with Njala University College under a new federal system devised in 1966. Abioseh Nicol, a Sierra Leonean, became the first African president of the combined institution. The union, seen as temporary at first, is now permanent. In 2005, Fourah Bay College and Njala University are constituent colleges of the federal University of Sierra Leone. Fourah Bay University remains an active institution of higher education with approximately 3,500 students. As part of the University of Sierra Leone, it grants Bachelor’s, Master’s, and Doctor of Philosophy (Ph.D.) degrees. Cyril P. Foray, An Outline of Fourah Bay College History, 1827-1977 (Freetown: Foray, 1979); Apollos O. Nwauwa, Imperialism, Academe, and Nationalism: Britain and University Education for Africans, 1860-1960 (London: F. Cass, 1997); Daniel J. Paracka, The Athens of West Africa: A History of International Education at Fourah Bay College, Freetown, Sierra Leone (New York: Routledge, 2003).